South Africa’s Chute Systems continues to train Namibia’s special forces and paratroopers, and has established a Military Parachute School in the country. Namibia has been expanding its military over the last decade, and this in July saw the commissioning of the Namibian Marine Corps, which was established with assistance from Brazil. The Namibian government awarded Chute Systems contracts to train its paratroopers and special forces, which resulted in the company establishing a Parachute School for the Namibian Special Forces in 2009. This is based on the South African model which can handle 64 trainee paratroopers per course. Chute Systems also established a Special Forces Diving School in Namibia. At the moment Chute Systems is training Namibian Special Forces in free fall and high altitude parachuting techniques. Douw Raimondo, the Chief Operations and Financial Director of Chute Systems, told defenceWeb that his company started training Namibian soldiers from scratch, and established a special forces and paratrooper capability. Training is ongoing, with the contract having been renewed three times. Raimondo said excellent results have been achieved, which were reflected in numerous SADC military exercises, of which the last two were conducted in Saldana Bay and more recently in Luanda, Angola. Although Chute Systems was not involved in training Namibian marines, the company has done diving and boat training work with the special forces and is in advanced stage of getting the special force’s seaborne capability established. Special forces training involves selection and several courses, including survival, minor tactics, seaborne, demolition, escape and evasion and urban warfare. The paratrooper course involves selection and a variety of courses, including urban, counterinsurgency, counterinsurgency/rural, static line parachuting and parachute jumping. Chute System’s mandate is to ultimately training Namibian Defence Force specialists to become instructors, thus making outside assistance training obsolete. In addition to training, Chute Systems has a tactical gear supply division, with all tactical equipment, such as uniforms, webbing, parachutes etc., being manufactured in South Africa. The company has created the Chute Systems Elite Force Tactical Gear range to meet its equipment requirements and offers a variety of equipment excluding weaponry. Chute Systems claims to be the preferred private military company providing parachute training to African clients, which already include Namibia, Botswana, South Africa, Zambia and Lesotho. The Sultanate of Oman is also one of the company’s customers. 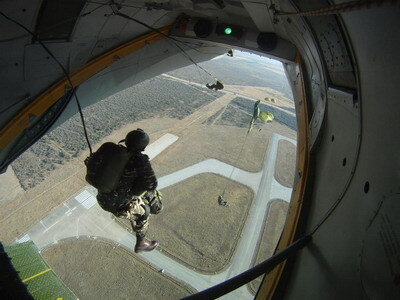 Last month the South African National Defence Force (SANDF) conducted final training and acceptance of a new high altitude parachute system (HAPS) for the airborne elements of the SA Army and SA Special Forces, which was supplied by Chute Systems and Lelebotse Projects and Engineering under Project Porthole. Chute Systems approached Lelebotse to partner on the HAPS project as Lelebotse is currently maintaining all parachutes and high altitude parachuting consoles for the SANDF. Lelebotse was awarded the SANDF HAPS contract and Chute Systems played a major role in the procurement process, technical advice and final training. The project was headed for Chute Systems but put on hold in 2013 because of non-broad based black economic empowerment (BBBEE) compliance. In September 2014, Lelebotse Engineering was named as the successful tenderer, with Chute Systems being the silent technical and training partner. “We are proud to be associated with this project,” said Raimondo, who added that the system puts the SANDF light years ahead of other African countries. All Chute Systems’ instructors are former South African ‘operators’ (special forces) or paratroopers. “Our concept is African for Africans,” Raimondo emphasised. “Our equipment is tested for Africa and our personnel are used to Africa and its people.” Raimondo and Chute Systems’ Parachute and Training Director Waldo Krahenbuhl are both current military qualified in high altitude parachuting, having done the courses at the parachute training school at 1 Parachute Battalion in Bloemfontein. Waldo was the Chief Parachute Instructor for the SANDF for almost 15 years and presented HALO/HAHO courses to many students and student instructors.